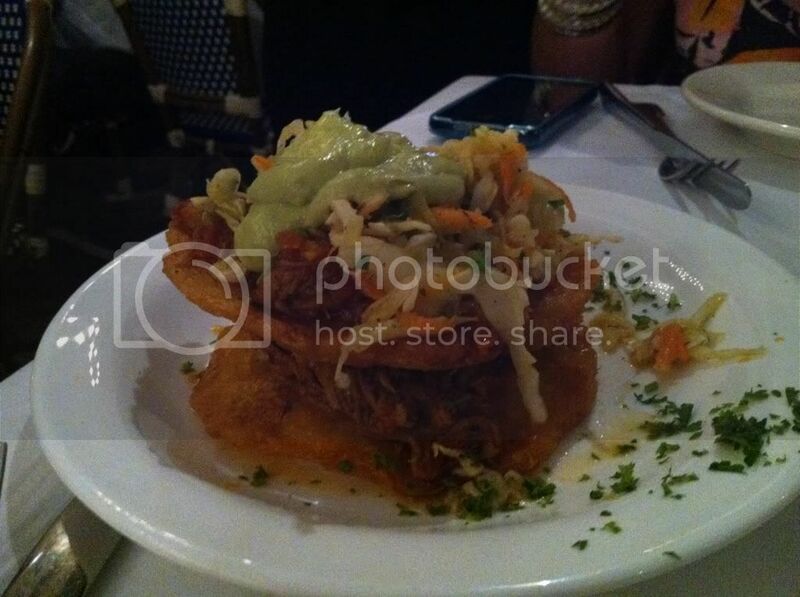 Fatgirl Hedonist: Casablanca Seafood Bar & Grill serving up more than just fish sticks! Casablanca Seafood Bar & Grill serving up more than just fish sticks! My friend was in the mood for seafood so we started doing out research and settled on Casablanca. Casablanca Seafood Bar & Grill is actually this year’s winner for ‘Best Seafood on the Miami River’ in the Miami New Times Best Of list. The front of the restaurant is on what looks like a side street right surrounded by warehouses with complimentary valet parking. The restaurant is actually right on the Miami river and offers outdoor seating facing the river where you can see boats passing by and even coming to dock directly at the restaurant. We decided to sit outside and enjoy the most of the scenery the restaurant had to offer. There are dozens of waiters whizzing by and the majority of them greeted us even though they weren’t our waiter. Our waiter was funny and very helpful in suggesting dishes once we told him this was our first time at the restaurant. 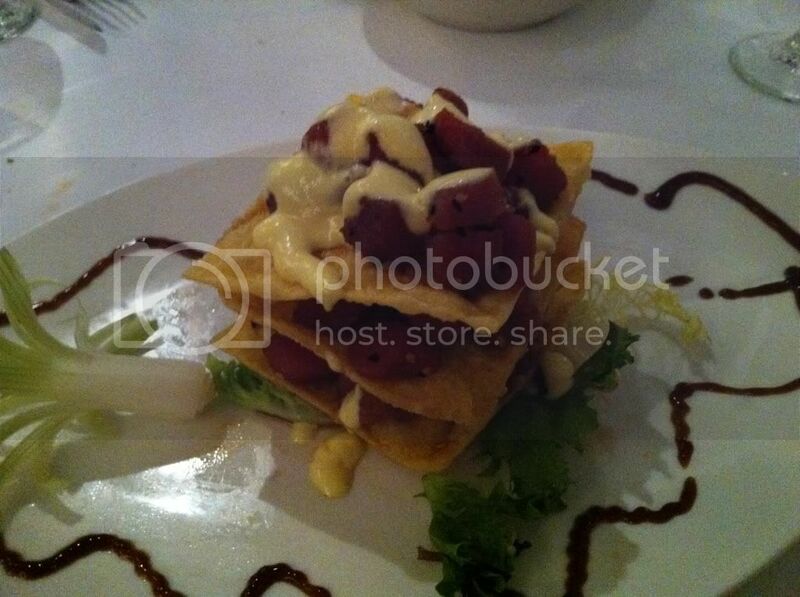 When it came to our food, we decided to get a couple of appetizers before getting I went with the Beef Tostones Napoleon, leave it to me to order beef at a seafood restaurant. The tostones are garlic scented green plantains with shredded beef sofrito topped with coleslaw and drizzled with avocado aioli. These were amazing! The shredded beef was so flavorful, similar to a really good ‘ropa vieja.’ The tostones were insanely enormous; I’ve never seen tostones 5 inches in diameter, they were thin and perfectly cooked. The coleslaw and aioli gave the dish a nice refreshing finish. The only thing you should know is, this is a dish that is meant to be shared. Although it looks small, it’s actually very filling and of course, I tried to tackle this bad boy on my own. So when it came time to order our entrées I knew I didn’t have a lot of room to get a giant meal. I decided to settle on something a bit smaller and went with their Ahi Tuna Tartar. The dish comes with pickled ginger, soy spiced sesame ahi tuna with California avocado served over warm wonton crisps. The tuna was cut into 1 centimeter sized cubes and tasted really fresh. The quality of the tuna was really good and the fish almost dissolved in your mouth. The only small draw back on this dish was the wonton ‘crisps;’ they weren’t very crisp and were actually almost chewy like Doritos that have been laying out all day. Another thing I noticed was the avocados promised in the menu with this dish seemed to be missing, turns out the drizzled sauce over the tuna was an avocado based sauce. I should mention, the avocado sauce drizzled over the soy and sesame spice tuna tasted really wonderful and refreshing. My friend had tackled their Puerto Sagua Seafood Zarzuela which is a monstrous plate filled with the chef ’s selection of the finest seafood flambéed with Cognac and simmered in a flavorful tomato saffron broth. Her dish had every kind of fish and crustacean you can imagine including mussels, scallops, shrimp and much more. I stole a piece of scallop to try and it was phenomenal, leaving me feeling jealous and wanting more. The Cognac flambé with the tomato saffron broth gave the seafood a totally different spin but still maintaining its flavor and integrity. I apologize for not snapping a picture of my friend's dish, I was too busy slipping into a food coma. If you’re ever looking for good local seafood, this is definitely a place to check out. The view and scenery of the boats passing along the Miami River and the friendly staff make this an inviting and fun place to eat. However, if you’re looking for a more intimate and serious experience, you can always sit inside the restaurant. The seafood itself is as fresh as it gets and as you walk into the restaurant, they boast their fresh catch of the day on ice near the kitchen. There are also weekday specials such as all you can eat free shrimp on Mondays, buy one get one free on the catch of the day every Tuesday, all you can eat oysters on Wednesdays, lobster deals on Thursdays, and Stone Crab Fridays. I actually had been to this retuarant just once and the food was great, but it lacked in friendly service. I went with a large party and ofcourse not all of those who went eat seafood. But like many restuarants we correctly assume that they do have non-seafood items on the menu. As we all begin to order it came down to the only two that don't eat seafood. The waiter while jotting the order called another waiter over and as if it wasn't obvious/loud enough said, "these two ordered churrasco! hahahaha, can you believe that? they're ridiculous." At that point I was ready to walk right out. Though being that I was with family, I did not want to cause anymore stress and made the best of our time there. Nonetheless I have never set foot in that restaurant again or ever will. That was by far the rudest waiter I have ever come across.